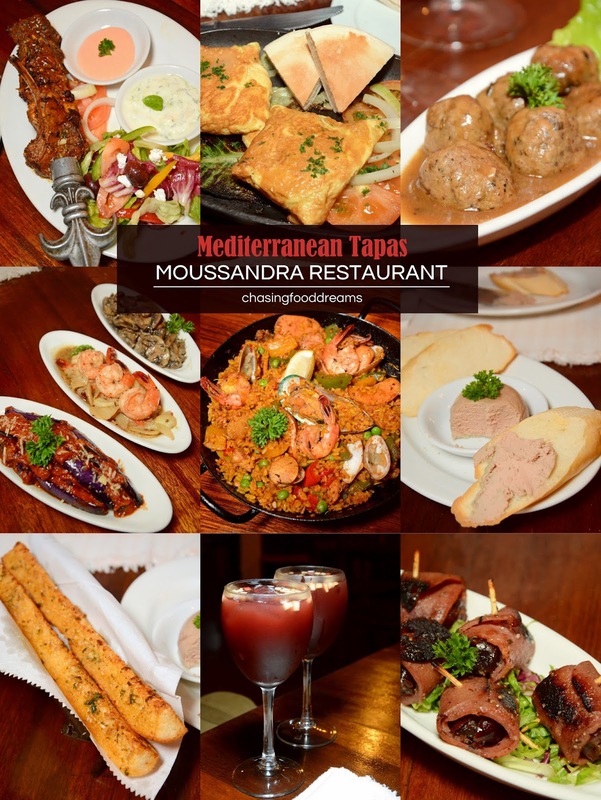 There aren’t many Mediterranean restaurants around but luckily for us, the few ones like Moussandra Mediterranean & Tapas Restaurant have been around since 1996 and is continuing to serve up authentic Mediterranean dishes to cater to our adventurous palates. Having been relocated from its original location to Publika at Solaris Dutamas, Moussandra is one of those restaurants that diners can count on. When a restaurant has stand the test of time in the F&B industry, you know they are very good, it’s as simple as that! Moussandra’s owner Alphonse takes pride in Moussandra. I can certainly see why. It’s a restaurant that really evokes a place to relax and enjoy a good hearty meal with family, friends or even businesses. Walking into Moussandra, diners are greeted warmly by their staff. The family-style ambiance is set with much warmness of earthy browns and reds to evoke a casual and warm Spaniel home. From his travels over the years, Alphonse displays his collections of Mediterranean items at the restaurant. Green vine leaves are also added for some charm as well as large posters of European artwork. The restaurant also has a large private room perfect for functions. That private room is nicely decorated with a Greek theme. From the Greek status to the bright blue door and Grecian ornaments, it would certainly be nice to dine in for any occasion. Moussandra’s menu features a long list of classic Mediterranean favorites from tapas to the usual appetizers, pasta, pizza, mains and desserts. We had a few of everything and kick started our evening dinner with glasses of Moussandra’s Red Sangria. Simply a must when dining Mediterranean as Sangria is the perfect wine and fruit concoction to go with all the rich dishes to come. There is also a white version at the restaurant. Tapas first with a very delectable Chicken Liver Pate (Terrina De Pollo) kicking of the evening’s meal. It’s a darn awesome pate. Silky smooth, creamy and rich buttery notes spread on baguette worked wonders as a starter. I can’t get enough of this pate, simply because I do happen to enjoy pate. Give this a try before you make any decisions about this dish because it’s a darn delicious pate! Garlic Bread is also good here. Quite the unusual cut, one gets long strips of toasty and crispy baguette fused with lots of buttery garlic and herb notes. During my college days abroad, I have been exposed to a lot of Greek food as my sister married a Greek. My brother-in-law’s mom would always cook or take us out for Greek food. So when I saw that Moussandra has Saganaki, I was pretty stoked. Our order of Egg coated Feta & Mozzarella Cheese, flamed with Pernod, served with Pita Bread (Saganaki) was set in flames right before our table! The next tapas features Lamb Meatballs in Brown Sauce (Cordero Albondigas En Salsa De Café). Juicy tender meatballs cooked in a tasty brown sauce is always a favorite on the tapas list. I can’t quite figure out but when I see meatballs on a menu, I tend to associate it with comfort food. This one too was deliciously comforting and great as snacks with wine or beer. I think this one is one of the most ordered tapas on the list. Who can resist a scrumptious Garlic Prawns in Olive Oil (Gambas Al Ajillo). Moussandra’s is indeed what every garlic prawns should be. Lots of rich savory and garlicky flavours with succulent sweet prawns is a sure crowd pleaser. We happily savor this and almost wish for bread to mop up that flavourful garlicky oil fused with crustacean flavours. The next two tapas are vegetarian treats of Pan-fried Eggplant with Chili & Tomato (Berenjenas Picantes) and Mixed Mushrooms Sauteed with Herbs (Setas Salteadas). Both are decent with good hits of flavours. The eggplant is very soft and has soaked up all the piquant tomato sauce. The mushrooms have earthy and garlicky notes. These two makes a good balance for all the other heavier meat, seafood and cheese tapas. Alphonso recommended the Beef Bacon wrapped Dates stuffed with Almond (Datiles Con Bacon), saying this one rocks. True enough, after I tried one, I found myself echoing his words. The salty and smoky bacon was countered with a burst of sweetness from the dates as soon as one bites into it. It is such a pleasant bite of flavours and textures. The sticky sweet dates paired so well with bacon and there was also a hidden element of surprise of almond inside. A must order unless you don’t take beef! I love the Greek Spanakopita. When my sister’s mother-in-law first made it for me, I thought it was such a great pastry. Using phyllo pastry brushed with melted butter and stuffed with a filling of spinach, cheese, eggs and cream, it was baked till golden and crisp. It’s been a while since I had this and when the dish arrived, it was so aromatic that everyone raved about it immediately. Beautifully coiled and baked, the Spanakopita was indeed tasty with lots of spinach filling. My only gripe is that I wished for more feta cheese as I cannot seemed to taste the cheese in this one, which I did feedback. It is still worthy of an order as the Spinach Pie with Feta Cheese (Spanakopita) here is well made and makes great tapas for sharing. Lamb Dolmades (Dolmades de Cordero) is another Greek dish that is well-known in the cuisine. I was also surprise to find this dish on the menu and can’t wait to try this. The lamb dolmades is served cold with tangy pickled vine leaves wrapped with a minced lamb and rice filling. It is usually cooked in stock with lemons so one gets a vibrant fresh citrusy note to balance the heavy lamb flavours. Moussandra serves their lamb dolmades with a creamy red pepper sauce. Mains arrived and we had two pizzas of Pizza Primavera and Pizza de Salmon. Pizza Primavera has lots of grilled eggplant, roasted sweet peppers, spinach and anchovies paired with oozing melted mozzarella cheese and herbs while Pizza de Salmon has salmon and mushrooms with cream on a tomato sauce and cheese pizza. It’s a thin-crust version here, making the pizza just right and not overly heavy from too much bread base. We also tried two pasta dishes of Prawns Aglio e Olio and Linguine Al Pesto. At Moussandra, one gets to choose between the regular pasta or the freshly made pasta. Do check with the wait staff if you prefer soft and tender fresh pasta opposed to the al dente dry pasta. Though the Prawns Aglio e Olio was good, I preferred the Linguine Al Pesto for its bold rich flavours of fresh herbs, strong cheesy notes with garlic and buttery pine nuts. Souvlaki is a classic Greek fast food of meats marinated Greek flavours and grilled over hot coals. At Moussandra, one can opt for their various souvlaki featuring beef, chicken, lamb or a mixed. We had their Mixed Souvlaki, a long skewer of the three meats well-seasoned and chargrilled. The bbq is Greek Salad, Roasted Capsicum Sauce, Tzatziki & Pita Bread. Flavoured with hints of spices, garlic and lightly sauced up with rich barbeque sauce, the souvlaki here is delicious. I enjoyed the familiar flavours of tender souvlaki and thought it was well prepared by the team at Moussandra. More Greek dishes followed and we had another favorite Greek dish of mine of Lamb Moussaka. Similar to lasagna except this one has a layer of potato instead of pasta and minced lamb is more often used than beef. The creamy and decadent layers of cheesy béchamel sauce with rich tangy tomato lamb sauce is sinful and pure comfort flavours. Great for sharing but if you happen to love rich cheesy sauces, then go all out for this on your own! One of their best sellers on the menu is their Paella. A popular Spanish rice dish cooked on the typical paella pan, it’s a well-balanced single dish meal varies within the areas in Spain. Moussandra offers three variations of the paella of seafood with meat, meat alone and a vegetarian one. We had their Paella Valenciana, a gorgeously saffron rice studded with lots of seafood, chicken and chicken sausages with vegetables and spices. The rice was indeed very flavourful from all the seafood and chicken. It was a crowd favorite that evening as well as we happily savored the rice despite being quite full from all the tapas and other main dishes. Moussandra has quite a few desserts on their menu but two of their best sellers were Rum & Raisin Ice Cream (Helado del Ron y de la Pasa) and Vanilla Creme Brulee. The Vanilla Crème Brulee proved to be so good, no one wanted to share this dessert. We had extra orders of the gorgeous thick baked cream set beneath caramelized sugar. A light tap on the caramelized sugar to crack it revealed silky smooth thick cream nicely sweetened. Such a perfect way to end a delicious Mediterranean meal!